This time on Steal of the Week we’ve got another one of Kershaw’s Starter Series Packs, this time with a little bit of a fun twist. Typically these kits are bundles of two knives or a knife with some kind of tool, but in this case the knife is accompanied by a set of Kershaw playing cards. Obviously the main attraction here is the knife, which is worth the price on its own. As is typical for the Starter Series this is an all stainless steel construction with a nifty blackwash finish. The full steel build puts this one on the heavy side for its size, but that gives it a hefty, secure feeling in the hand. The handle shape is very ergonomic and fits the contours of the hand nicely, the only downside I can maybe see is that you feel the pocket clip against your palm a little bit, but it isn’t all that noticeable. The clip is equipped in the right-side tip down position, with the bayonet style enabling a deep, secure carry. The blade is deployed by way of the flipper, which is very easy to snag thanks to its ample size. This knife features Kershaw’s proprietary Speedsafe assisted opening mechanism, so you know exactly what kind of snappy, responsive action you’re going to be getting. 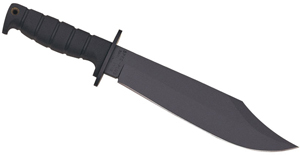 The blade is a 3.25″ drop point with a hollow grind, held ably in place by the sturdy stainless steel frame lock. The playing cards in the kit are pretty standard, with a minimalistic scratched steel pattern and the red Kershaw logo on the back. It’s a pretty attractive set, and a nice change of pace from the kinds of things you usually see bundled with knives. If you’ve been putting off your dreams of being a street magician or card shark this may be just the kick in the pants you need. This week on Spotlight Series we’re taking a look at LionSteel’s new KUR line of flippers. This Michele Pensato design has awesome ergonomics, a sleek appearance, and even manages to offer up a surprise or two. Looking at the knife, the design is very similar to last year’s TRE flipper series. The KUR is quite a bit larger, with an overall length of 8.27″ as opposed to the TRE’s 6.89″. The KUR’s beefy frame makes it feel very substantial in the hand, and the overall shape of the handle lends it outstanding ergonomics. The index finger milling on the presentation scale is an especially nice touch. There’s also some pretty rugged jimping up on top that lets you really lock your thumb in. Deployment is managed using the flipper, and the IKBS ball-bearing system gives it a pleasantly snappy action. The flipper isn’t ultra responsive, so you need to press down with some authority to get the action you want. It’s definitely satisfying, and leaves little danger of accidental deployment. The blade is a drop point manufactured from Sleipner stainless steel, coming in at 3.43″. LionSteel is always good about making their liner locks nice and sturdy, and the KUR is certainly no exception. For the aesthetically-minded among us, there are a lot of great style options to choose from in this line. Most of the models feature a stonewash blade finish, but there are two that have a tactical black stonewash finish, available with either black or brown G10 handles. The stonewash blade finishes come with black, orange, or OD green G10 scales, as well as two aluminum handle variations. The first is a basic black, and the second also appears to be black at first blush. But what you’re looking at is metamorphosis aluminum, which features a special heat-sensitive coating. Under normal room temperatures it’s a black handle, but once it hits over 73 degrees Fahrenheit it starts to change to a bright camouflage pattern. I’m not sure if there are any practical applications to this, but it’s an undeniably cool feature and the first of its kind. This weekend our special is the Kershaw Thistle, a robust EDC folder with a twist. This knife is highly affordable, highly ergonomic, and highly creative, so let’s see what it is that makes it so different. Contrary to what your suspicions may be, the button is not for automatic deployment. This is strictly a manual opener, with the dual thumb studs providing an easy, responsive deployment using either the thumb or middle finger. It’s not a mindblowing action but it’s satisfying and quick. With the blade extended our big weird button now comes into play. 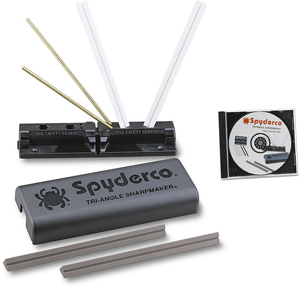 The blade is held in place with a liner lock, but you don’t deactivate it in the typical way. If you look in the handle here, a press of the button disengages the liner lock for you and lets the blade close down. This will take a little getting used to, I know the first few times I went to close the knife I instinctively reached over for the liner lock and was momentarily confused. You’ll also want to note that once you move the blade a little you can let go of the button. If you try to hold it continuously the other liner will actually block the blade and you won’t be able to close it down. It’s a different system, but once you wrap your head around it it’s pretty intuitive. Beyond the exciting button situation, the Thistle is a really solid all-around knife. The handle is Zytel with the Kershaw K textured over it to enhance grip. It’s got an ergonomic shape that feels just about perfect in the hand and provides you with great leverage and a nice cutting angle. Pair that with the monster belly on the 3.25″ drop point blade and the Thistle delivers some terrific slicing performance. Another nice thing about this knife is that if you can get used to the push-button lock the whole package is very lefty friendly, thanks to the aforementioned dual thumb studs and a reversible, tip-up pocket clip. This weekend our special is another unique product from the outside-the-box thinkers over at Cold Steel knives. Designed to evoke the classic switchblades of the 1950s, the Ti-Lite quickly became a Cold Steel favorite, but was unattainable to many due to its higher price point. Cold Steel rectified that situation with the 26SP, a smaller, affordable variation of the design. The thing I love the most about this knife is how much versatility you have when it comes to how you choose to open it. The most obvious is the thumb stud, which grants you a super swift, snappy action. That’s probably going to be the preferred method for most users. The secondary action is to snag the backside of the double finger guard on your pants during a pocket draw for a quick wave-style opening. If you want to get really crazy, you can also use the finger guard with your thumb like a front flipper, or snag the jimping on the finger side of the guard and use it like a regular flipper. This staggering variety of deployment methods make the Ti-Lite a lot of fun to open. The one detractor I can see on this model is the liner lock, which is a little difficult to disengage due to its stiff lock-up and smooth finish, but that’s preferable to the alternative of a loose, unsafe lock. Handling is pretty comfortable, considering the straight shape of the handle. It’s a good size and a nice width, so it feels substantial in the hand, and grants you some excellent dexterity in either your forward or reverse grips. Handle scales are a glass-reinforced Zy-Ex, which is durable and impact resistant and its use was one of the ways Cold Steel was able to get these to their affordable price point. The scales are built over some sturdy stainless steel liners, so this is an all-around solid knife, with a nice 4″ spear point blade that comes razor sharp out of the box. This week on Spotlight Series we have a very special KnifeCenter exclusive that we’re super excited to be able to bring to you. When it comes to Benchmade gentlemen’s folders the Nakamura is one of the very best, and the elegant knife just got even more sophisticated with the addition of gorgeous wooden handle scales. As far as its overall size and shape, this version is the same as the other varieties of Nakamura that have come before. But as far as I’m concerned, the wooden handle scales really take the aesthetics to another level, with the darker finish on the wood nicely offsetting the lighter stonewash finish of the blade. The cherry on top is the slick orange pivot accent, which matches the barrel spacers, making this an all-around eye-popping piece. Fortunately this knife is much more than just eye candy. The deployment action is just as smooth and responsive as is typical for Benchmade, with the ambidextrous thumb studs making for some snappy action using either the thumb or middle finger. 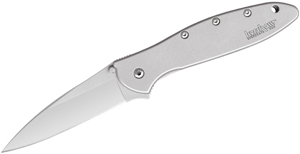 Blade is a 3.08″ in a drop point shape, manufactured from M390 stainless steel. The M390 is going to be good for edge retention and corrosion resistance, so you’re going to get some solid use out of this knife. Blade is held in place with Benchmade’s trademark AXIS lock, which also gives you another method to snap the blade out quickly. Handle is the same shape as previous Nakamura models, but the smooth, contoured wood gives it pretty much an all-new hand feel. The already ergonomic shape feels really comfortable to hold, and the four finger indents give you that sense of control you want. Add in a reversible, tip-up pocket clip and this is a great all-around package.